There are 92 posts in this topic. You are on page 1 of 2. By far the most dirty job when doing a playfield swap is cleaning the wiring harness. Anyone who has ever tried to take a shortcut and skips this step, quickly finds out what a mess black fingerprints make on every part of the playfield and rubber. The coil dust is carbon, iron and lead, so wear gloves. If you blow some of the loose dust off with an air compressor; do it outdoors and downwind from your garden. DO NOT blow that dust indoors and permanently contaminate your basement/garage. So we have a little prep to do before we do the actual cleaning. 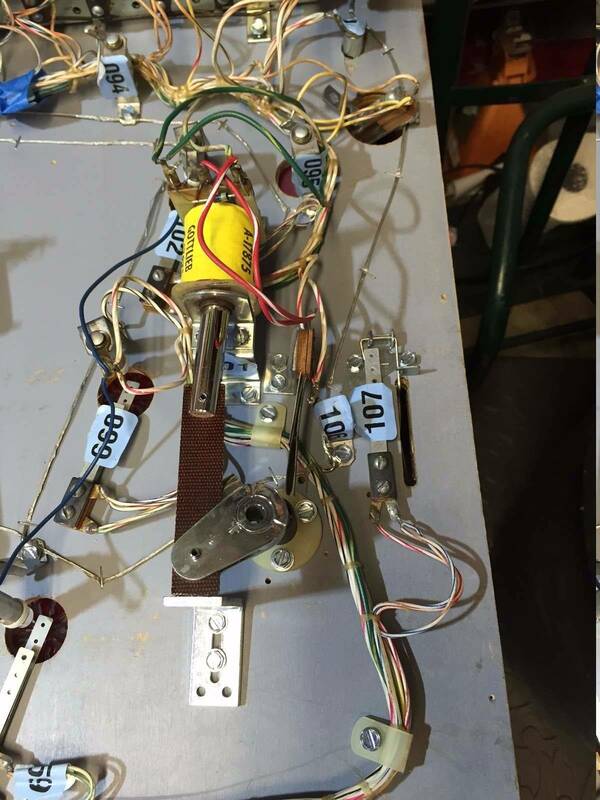 We of course, have to remove the wiring harness from the playfield. 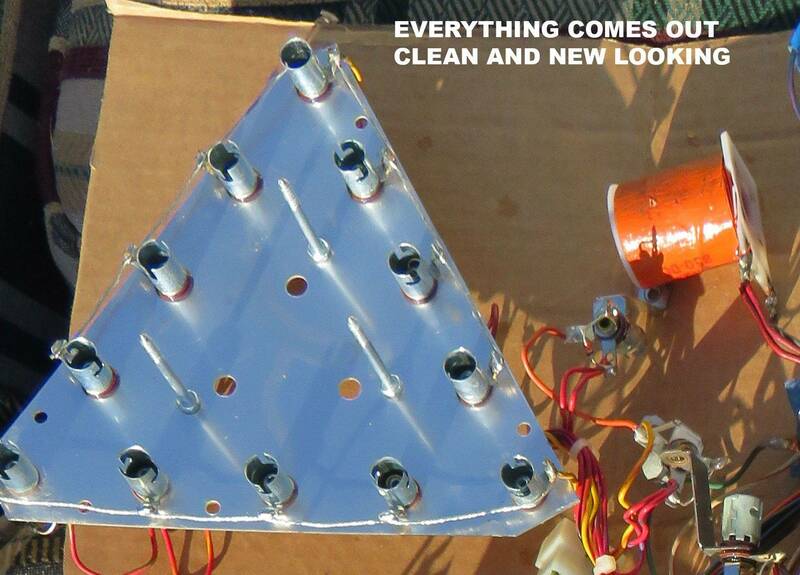 We want to remove bulbs and LEDs so the insides of the sockets can be cleaned. 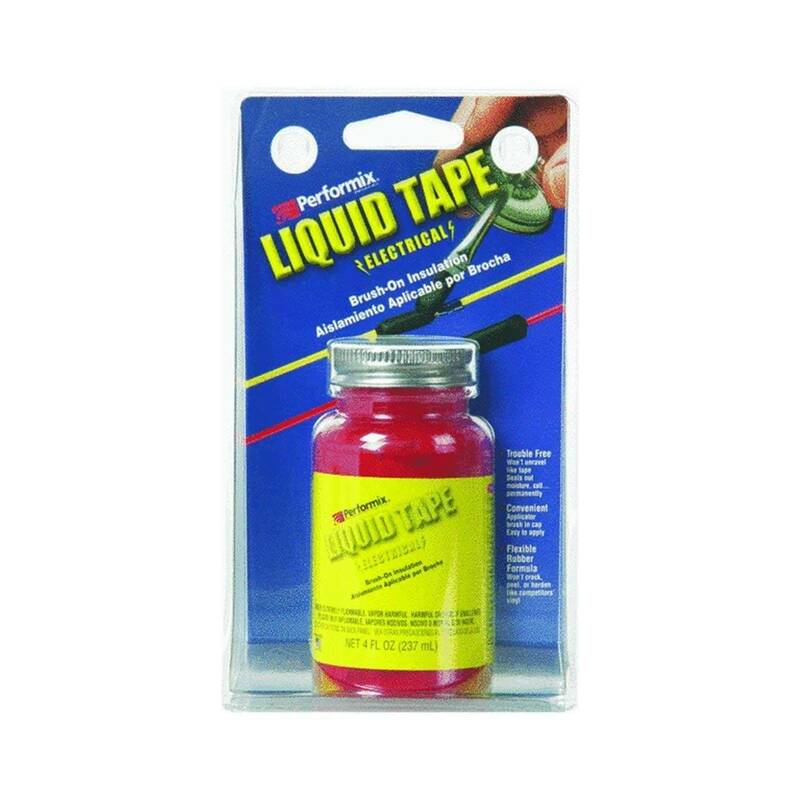 Label everything with 3M Blue Painters Tape, it will remain stuck on throughout the cleaning process. 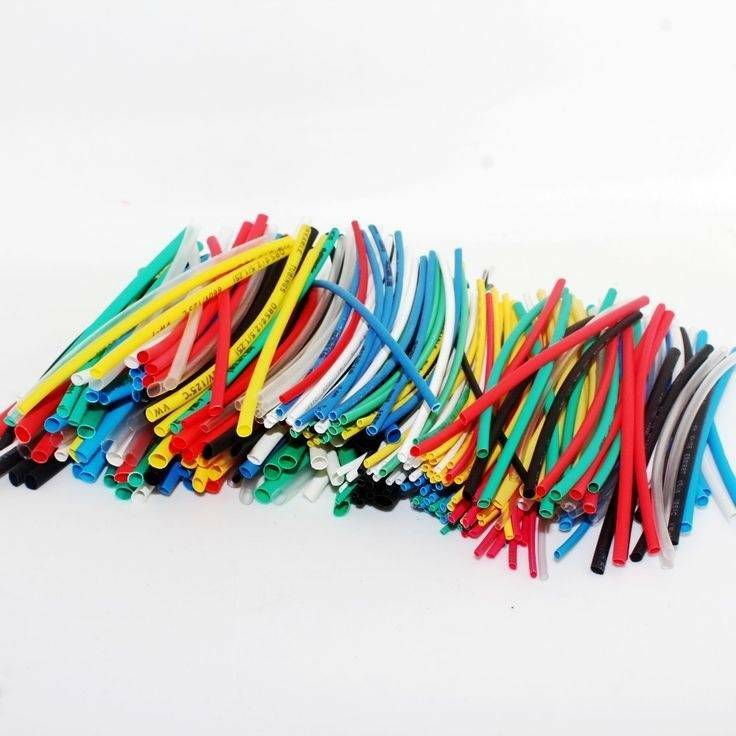 We want to remove Coil Sleeves, Yokes, and other disposable items that would be more trouble to clean than replace. 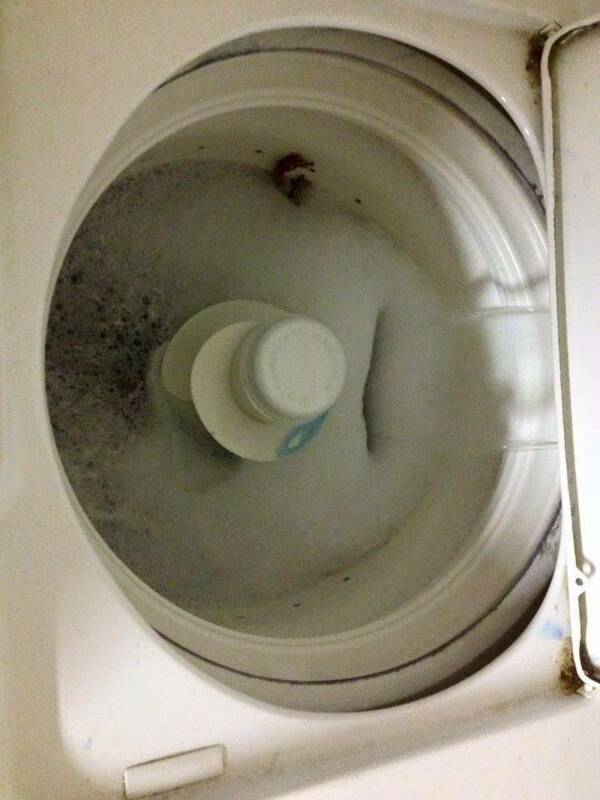 The more soil load you put in the washer, the less detergent is available to clean the other items. A .40 cent coil sleeve is not worth your time to try to ream out (and you can never clean the metal flakes that are embedded into the nylon). 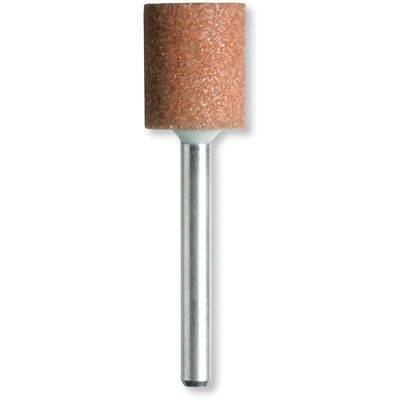 You want to take the plungers out of all the coils, so they can be cleaned too. Really, just throw it away. If somebody sprayed WD-40 on the coils or something like that, then do a pre-clean with Naphtha so the detergent does not waste all it's power on the oil. 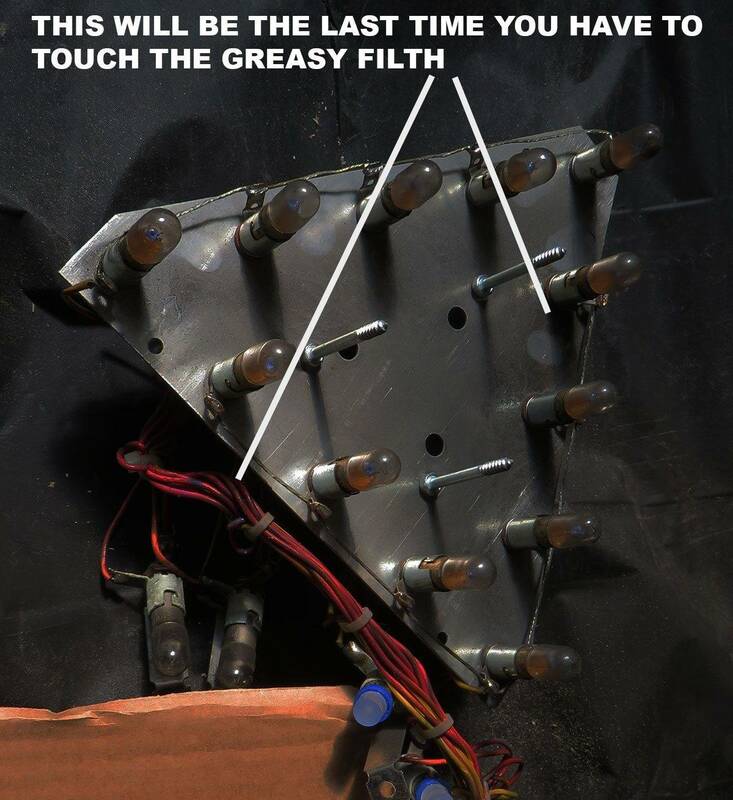 Otherwise, this will be the last time you have to touch this mess. 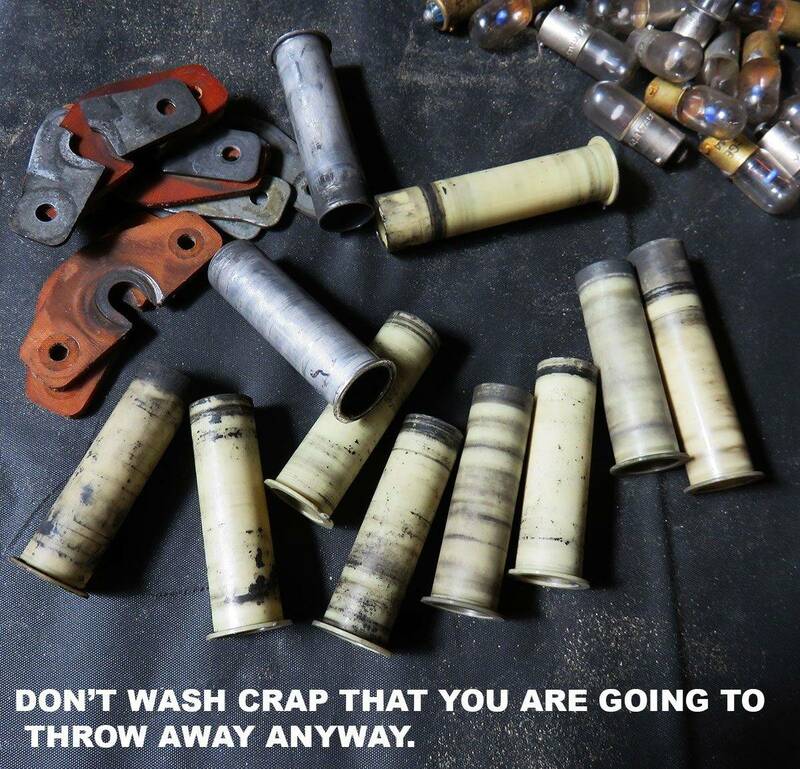 Coils, circuit boards and most everything else can get washed. 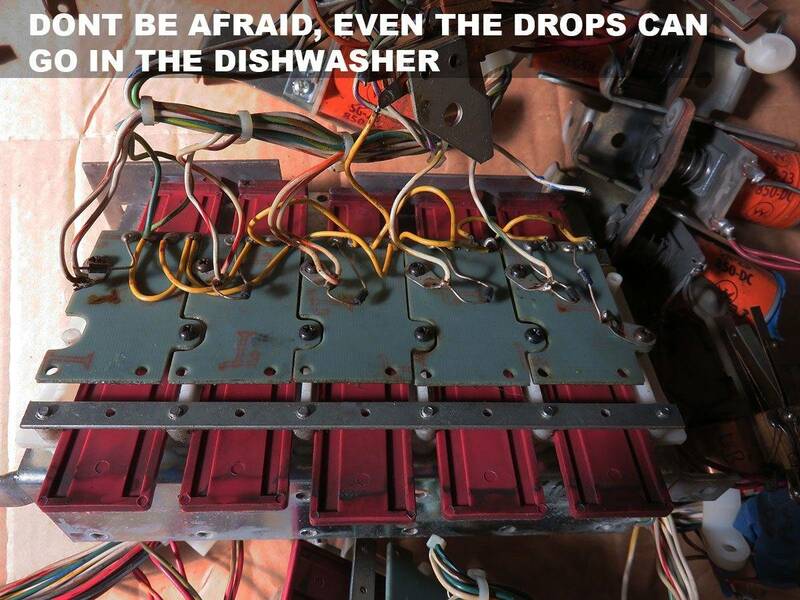 Just don't put speakers, open relays, enclosed switches or other delicate items into the washer. We want to put the entire harness on the top rack. The bottom rack is too close to the heating element, and if a Molex connector should fall through the rack and rest upon it, it will melt. Once the harness is arranged, make sure the scrubbing wand on the bottom of the rack is still free spinning. The washer won't clean well if the wand is obstructed. 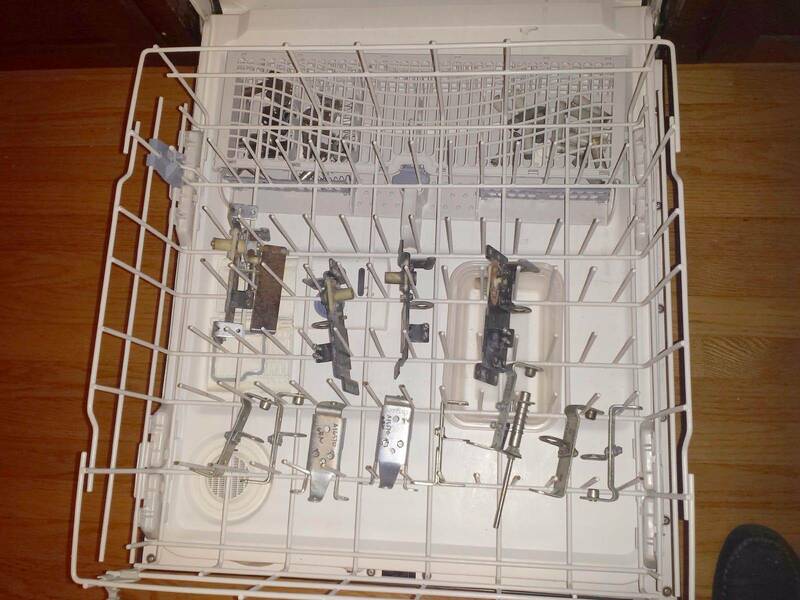 All the small brackets can go into the silverware basket on the bottom rack of the dishwasher. This is a good pre-tumbling step, as you never want to contaminate your tumbling media with dirty materials. 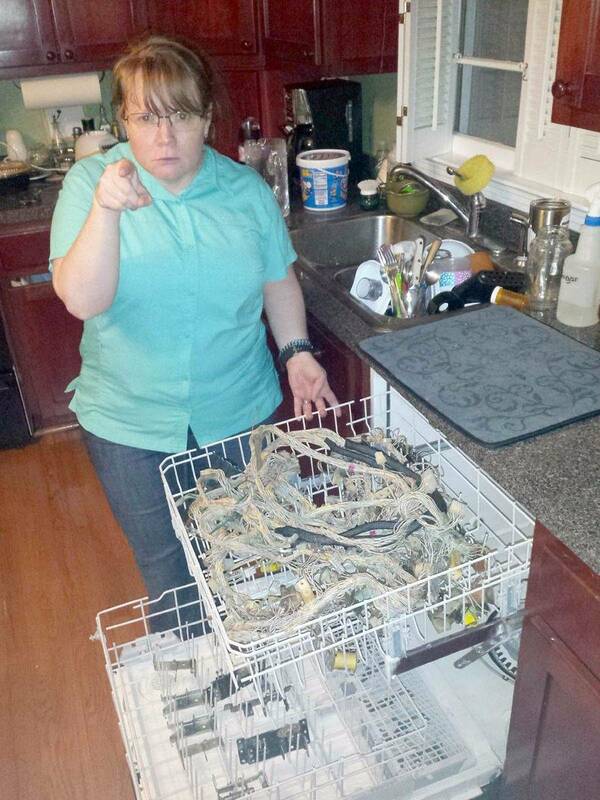 In my experience, I know that most men have never learned how to run a dishwasher. Yes, they can somewhat put the dishes in the right spots and press start, but otherwise, they have no idea what they are doing. 1. Call you wife and be SURE she is not coming home for at least 2 hours. You might not have been listening when she said that it was a 1/2 day at work for her. 2. If you have liquid detergent, you have to shake it to disperse the sand in it that normally sinks to the bottom, before you use it. 3. Liquid or powder detergent both work the same for cleaning harnesses. 4. Run the hot water at the sink until it's HOT. 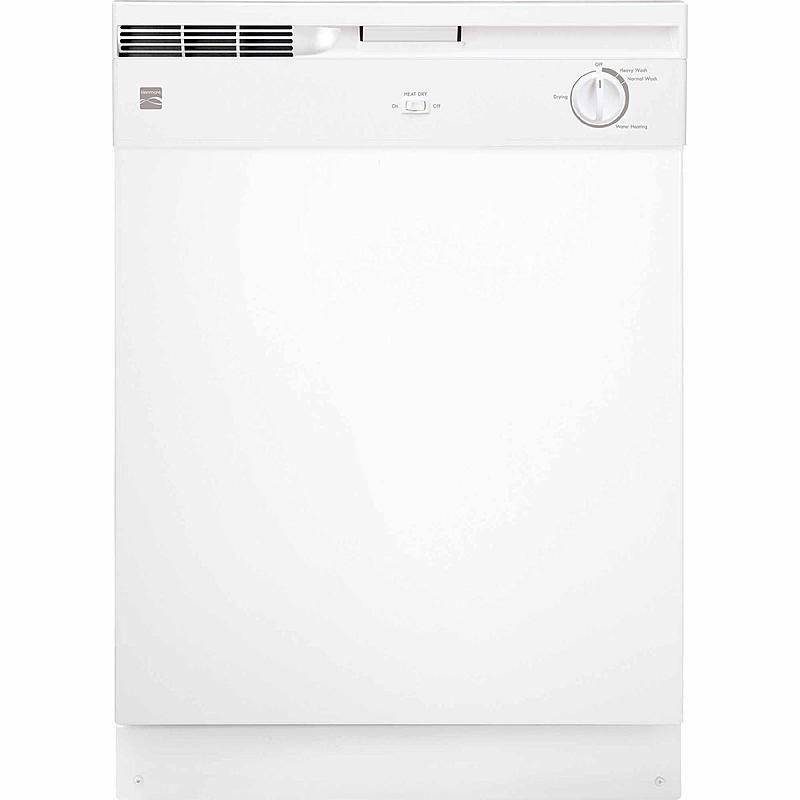 If the dishwasher fills itself with lukewarm water, it will take forever for the dishwasher to bring it up to temperature. 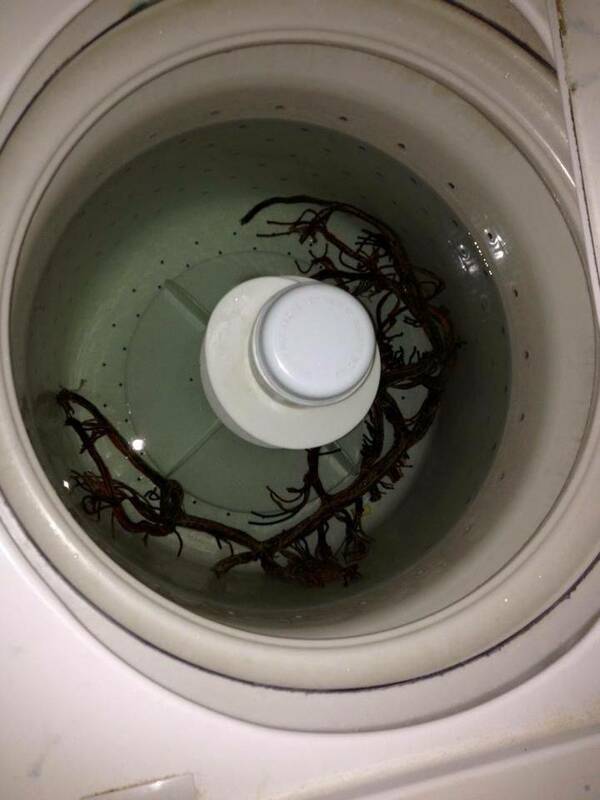 The wash cycle won't start until the water reaches 160*F.
5. Fill both sides of the detergent cup for the Pots and Pan cycle. This cycle uses the most detergent of any of the presets. 6. Close the door, press "Pots & Pans" and press (or turn the knob) to START. 7. In about a hour the washer will play a little song that the "dishes" are clean and dry. 8. The harness will be VERY hot and flexible, so put it onto a 24x48" sheet of cardboard to help you carry it. 9. 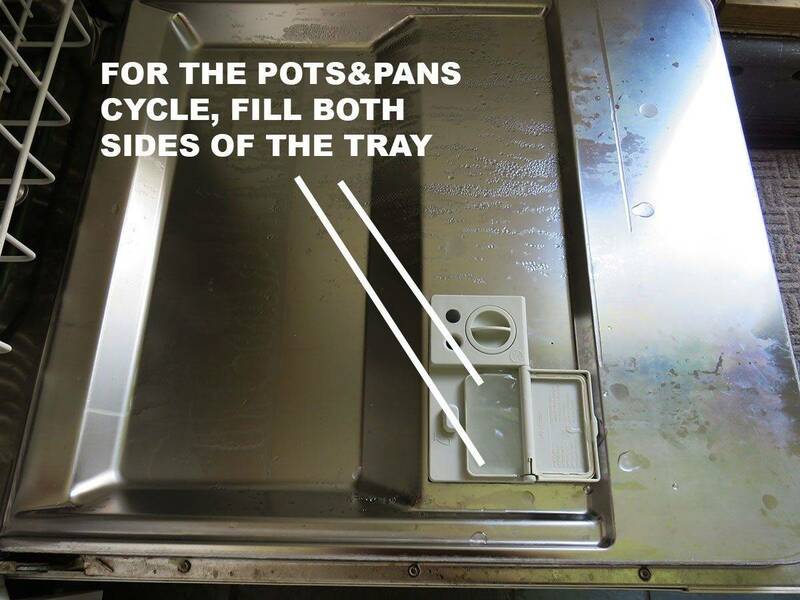 Check the trap at the bottom of the dishwasher for any small screws or staples that were hidden in the harness. If you leave them for your wife to find, she will know something is up. It was probably never this clean at the factory. The drops come out nice and clean (you know what a nightmare it is to clean them conventionally with a toothbrush). If you want to really get crazy, you can take the drops out, wax them and then reassemble. Clean, slippery drops never hang up, they drop like stones. Leaf switches come out looking like shiny copper from the sand blasting it gets from the detergent. In less than a hour you have a spotlessly clean harness that is a pleasure to work with. No filling and soaking in the bathtub. No unsoldering coils or drop target mechs (how many hours would that add to your job?). 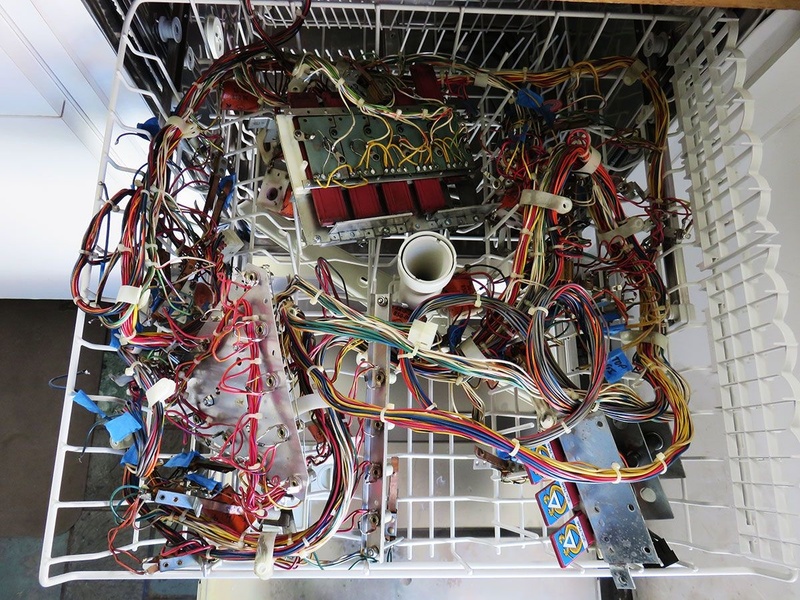 Once you have done a dishwasher cleaning, you will never go back to any other way. Sweet guide! 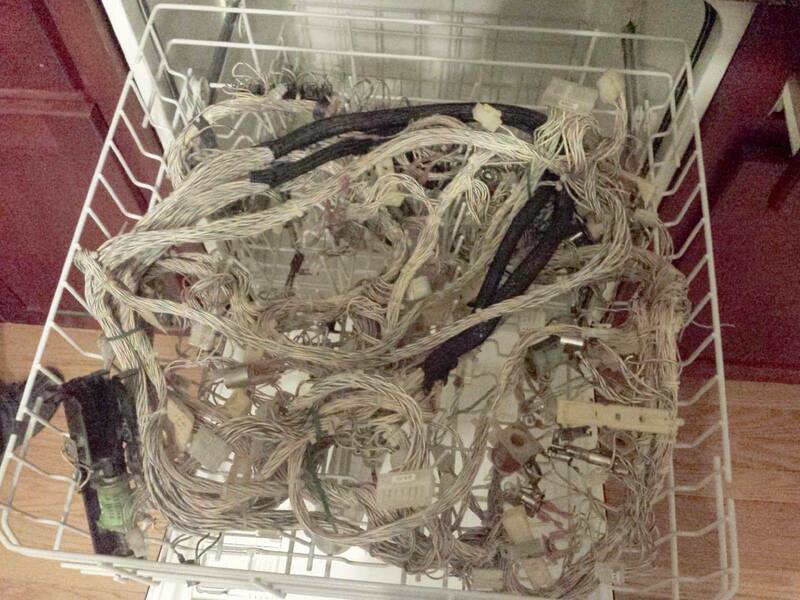 I've washed other parts in the dishwasher before and circuit boards in the bathtub lol but never thought it would be ok to put all you did in the dishwasher. The results look great! Those coils must have had a more plastic based wrapper though, I doubt a paper wrapped coil woild fare so well, or at least the wrap wouldn't. How did the decals fair on the other side of those drop targets? Those coils must have had a more plastic based wrapper though, I doubt a paper wrapped coil woild fare so well, or at least the wrap wouldn't. Wrappers that are made of printed "masking tape" do totally fine. Homemade wrappers on regular paper end up in the strainer at the bottom of the washer. They were reproductions from ebay that came off in the wash. I've had OEM laminated ones that stayed on just fine. I just figure if I'm doing a playfield swap or restoration, I'm replacing the drop decals no matter what. Oooooh this is just in time... I didn't have time to wash the harness from my Big Hurt rescue over the holiday, but I'll be trying it this week, maybe even tonight...! It's amazing that your wife can use your $300 chisels to open paint cans then shrug when you yell at her, but if you use the dishwasher you sleep in the doghouse. Will it Vid? Will it? LOL! I don't own a dishwasher due to our small kitchen size... NOW WHAT?!?!?! P.S. Great job on the guide! 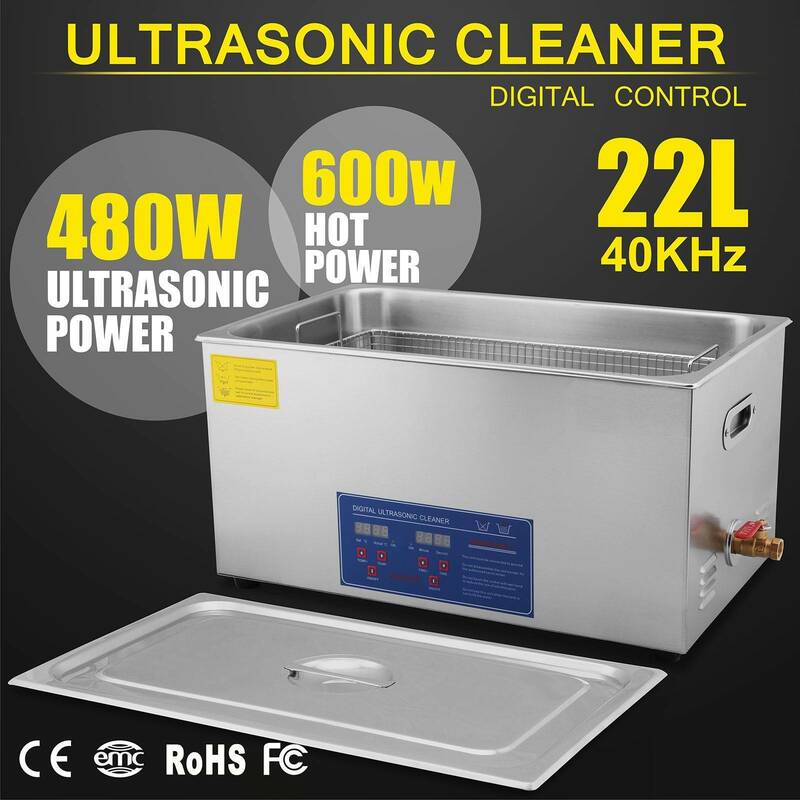 You could buy a cool 22 liter ultrasonic cleaner for $299 on ebay. If they don't stick, Sharpie will survive the cleaning and can be removed with alcohol. I actually bought the large vibrating tumbler from HF tools. I "think" the bowl can handle liquids. When the dog pukes in his bed, I always take it to the laundromat so I don't contaminate my home machine. 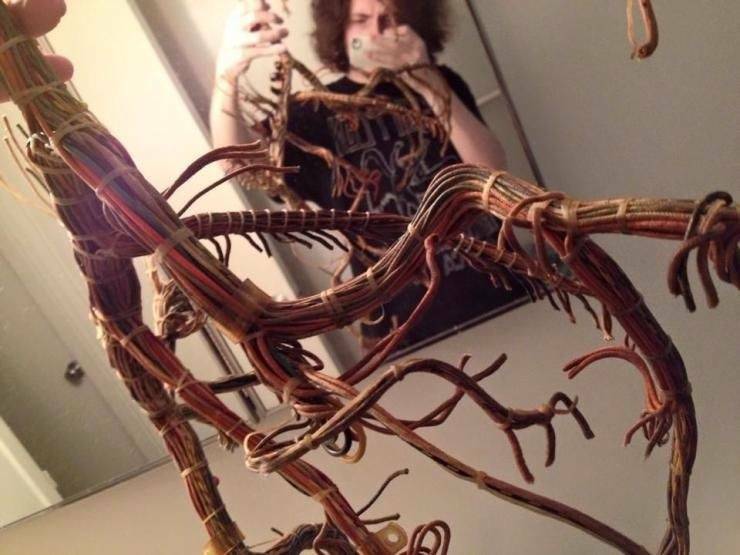 It was pretty compact though, I don't think I'd put ones in there where every wire is super stringy. Definitely took a leap of faith but it turned out fine. 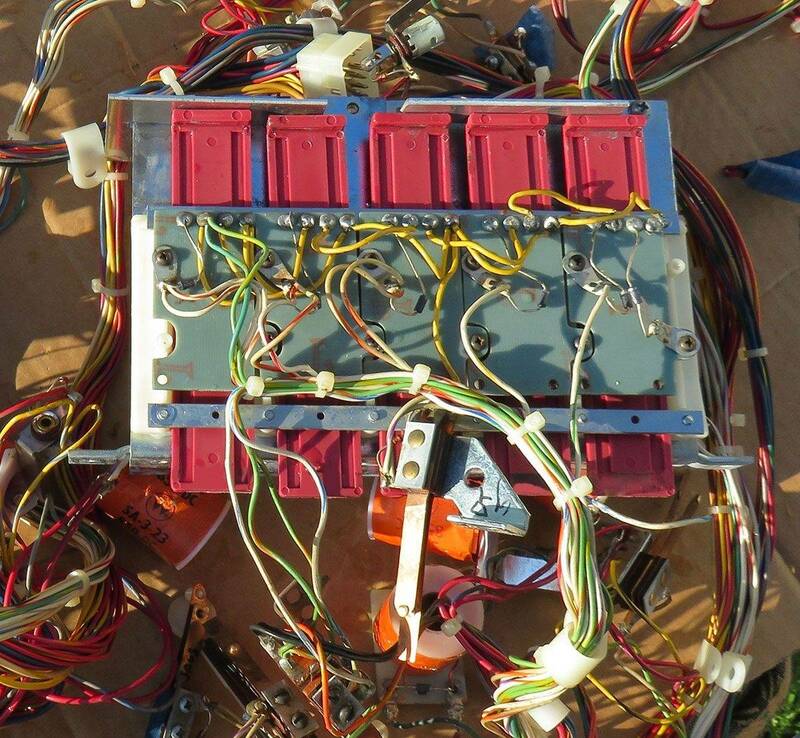 It did lose a bit of it's shape though, which is slightly annoying putting it back together (saving a parted out machine, everything was cut from the harness) even if you have a schematic, it would have been nice only to use the schematic to "double check". 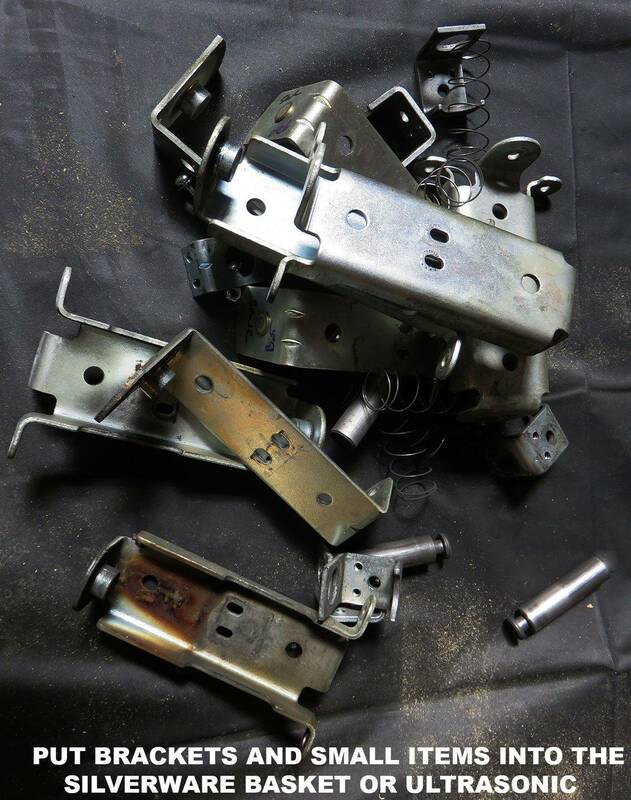 Friggin' Gottlieb and their tank-like build quality... when I removed the harness I simply unscrewed the mounting brackets from the PF, but damn... on Big Hurt at least, those brackets must weigh over 10 pounds combined! Took me another hour to remove them all and label the coils. Actually the coils are probably the least of my worries because if the labels on all the Molex disconnects come off, I'm well and truly screwed! But, since I had to remove all the brackets and mount plates anyway, may as well throw 'em in and see what happens. Zee wife, zometimes zhe iz pretty kewl. Like tonight. See those dishes in the sink, they were in the washer pending a cycle... I took 'em out and piled 'em there. They can be bathed AFTER my harness is done. Our next meals might be pinball-seasoned! Mwuahaha. Excellent write up as usual Vid. Can Gottlieb switch stacks eg Ax, Bx and player control motor be put in as well? Well technically I purchased the dishwasher and installed it. It was a very expensive piece of equipment ($1200 at the time) so I am not sure I would want to get all of the crud into it. Since the dust may contain lead couldn't that be bad for your dishes afterwards? I mean it cant all get flushed out. Since the dust may contain lead couldn't that be bad for your dishes afterwards? I mean it cant all get flushed out. 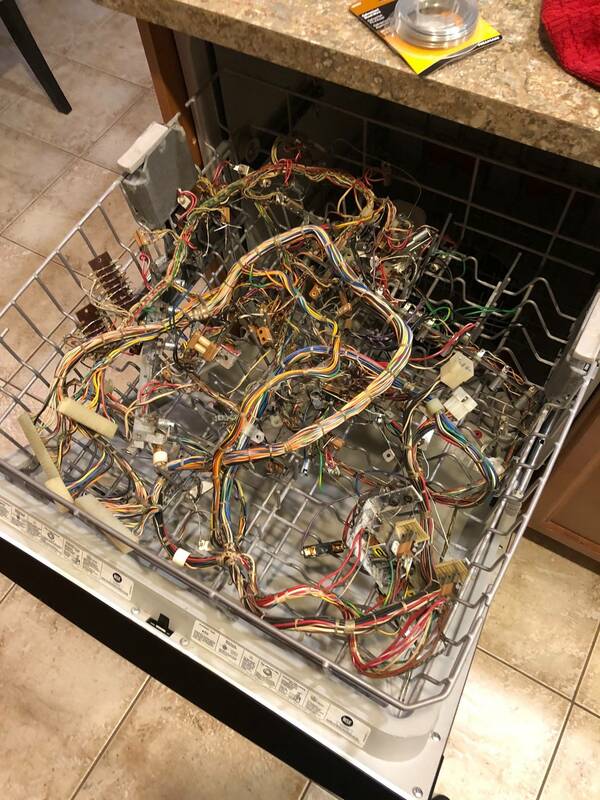 I've used the lead tester at work and it does not detect lead on a swipe from the walls of my dishwasher after washing a load of circuit boards. 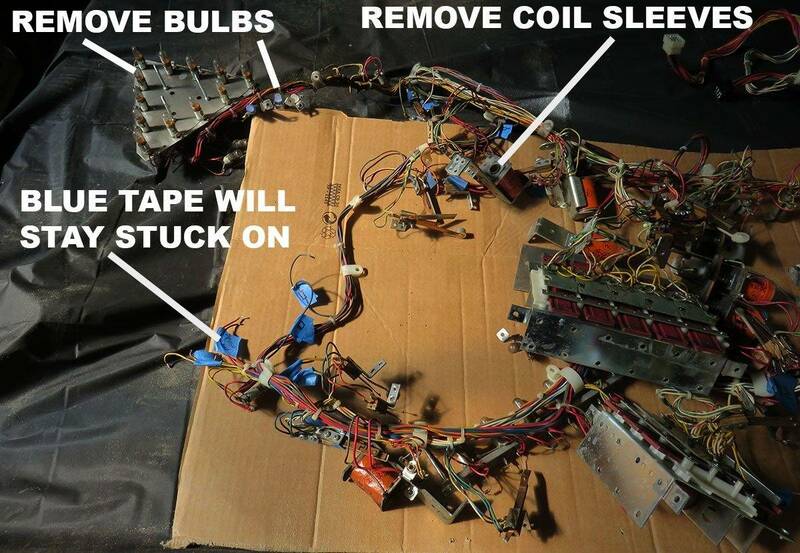 I assume circuit boards have 100x the lead of a wiring harness. Dishwasher detergent has sheening chemicals that keep minerals from sticking to the sides of dishes and glassware - that's why you don't get spots all over your glasses. 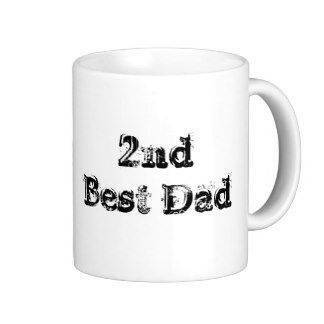 Your favorite coffee mug from China probably has lead in the glaze that leaches out every time you pour hot liquid into it. Entire circuit boards with chips, etc. go in too? Anything special to make sure everything's dry before power up? 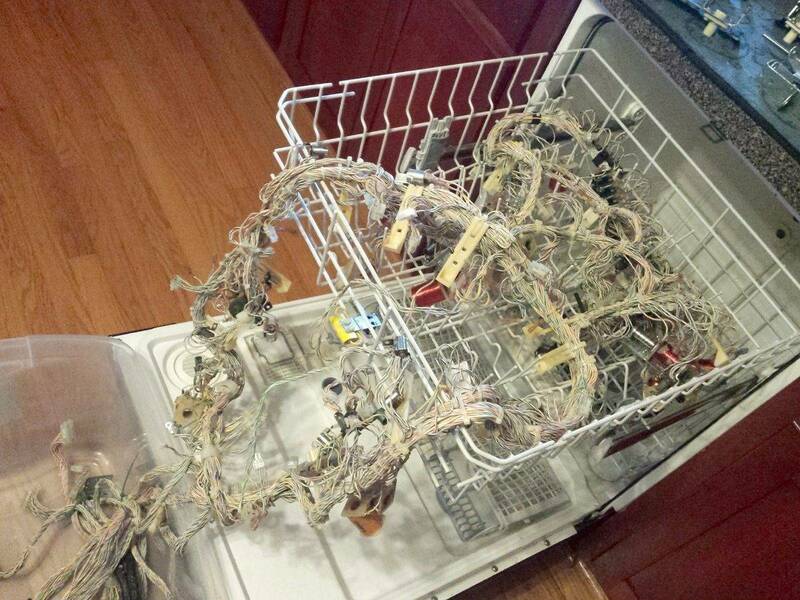 Heated dry in the dishwasher? 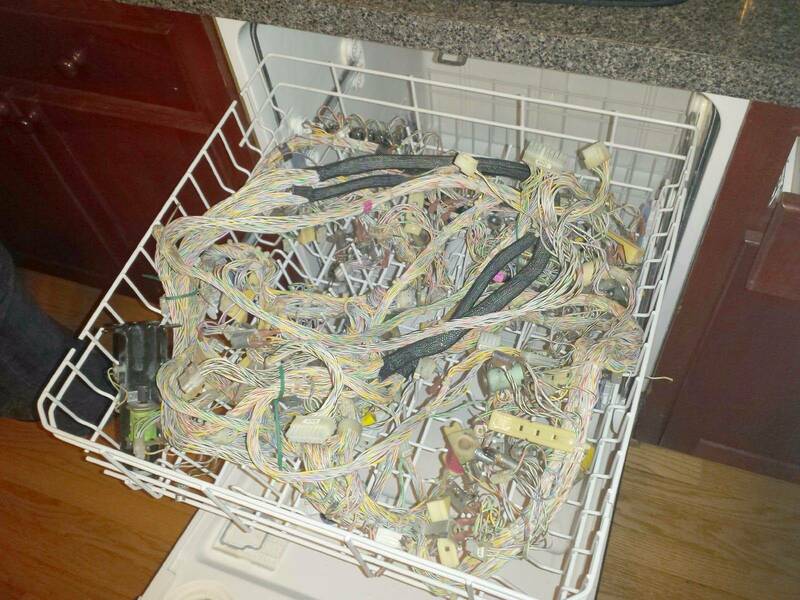 I've used the lead tester at work and it does not detect lead on a swipe from the walls of my dishwasher after washing a load of circuit boards. 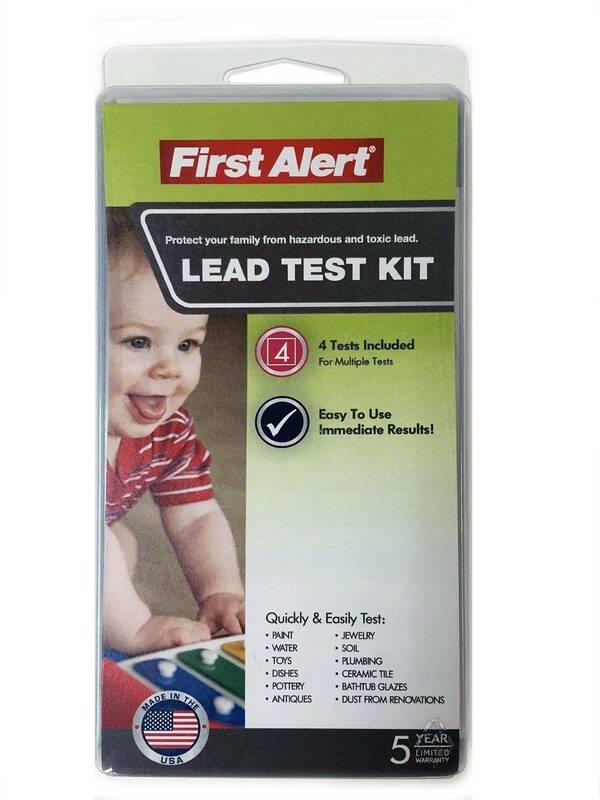 Would have thought you would have mentioned that earlier on in the post, if you were somewhat concerned (or even remotely questioned) about the possible lead contamination that you tested your dishwasher. I'm sure you thought others may have had the same thought? Glad your swipes came up clean, but I still doubt you will find someone in the poison control industry who would be OK with putting lead (not contained in a glaze) in a dishwasher. Not trying to sink your process here, just think people should know of the potential risk that they might not have thought about. Would have thought you would have mentioned that earlier on in the post, if you were somewhat concerned (or even remotely questioned) about the possible lead contamination that you tested your dishwasher. It was more of a circuit board thing than a wiring harness thing, as all the solder on those old boards is lead. We do lead testing at work, so it's always interesting to me. just think people should know of the potential risk that they might not have thought about. 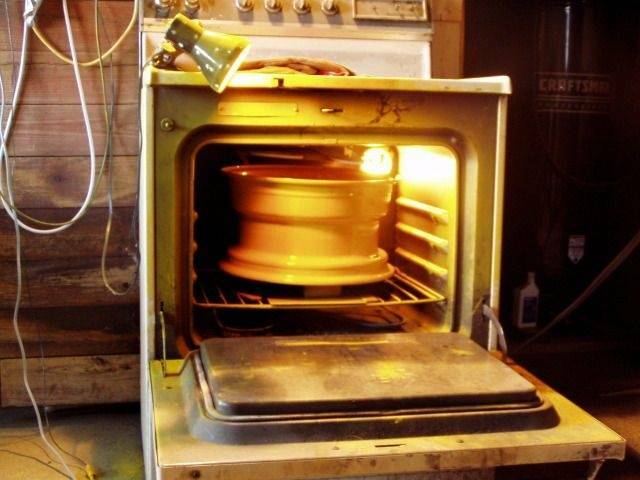 Aluminum cookware is banned in many parts of Europe and SA. Stainless Steel cookware can leach toxic chromium and nickel into your foods. 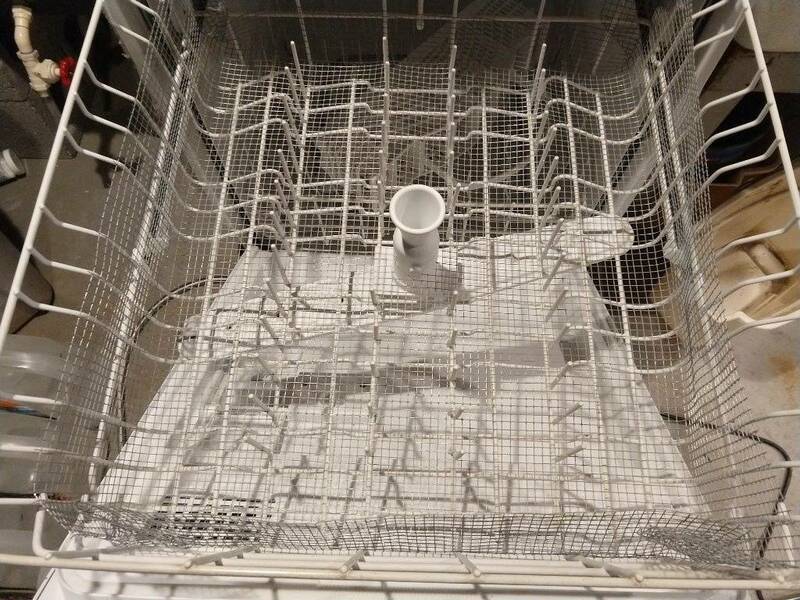 Hell, even the inside of your dishwasher is low grade stainless. Your expensive copper bottomed tea kettle leaches heavy metal into your tea. If your Teflon pans were made before 2015, they leach PFOA into your food. If you feel any worry about using your dishwasher to clean circuit boards or wiring harnesses, get a $299 Ultrasonic and it's basically the same process. Thank Zeus, the paper Molex disconnect labels (Gottlieb probably put 40 of them on here) survived! Looks like the few casualties were the labels on the flipper coils - which were probably replacements and so used cheap paper instead of "masking wrapper" - and a couple other random coils. Most survived just fine. There's no trace of the coil paper in the washer (gone just like the paper labels on pickle jars and beer bottles ha ha). Only straggler parts in the bottom were a couple loom clips that slipped off. But being the idiot I am, I forgot to ID tag the coil wires with blue tape. This is because I originally tagged the mounts / mechs / plates with Sharpie... only when I realized they were just collectively too damn heavy and bulky to fit in that top rack, the subsequent hour+ of removing them all pressured me for time and distracted me from remembering the tape. Instead I'd marked the coil ends with Sharpie, but that washed clean off the nylon! Ironically though, the Sharpie did stay on the metal parts (as I originally intended), so hopefully I can puzzle this out with the manual. Anyway, at first glance I can say it was worth it: no more grimy coatings, no crusty dirt; the few leaf-style contacts look cleaner and the bulb sockets are especially brighter. I washed the coil sleeves in the utensil basket for the hell of it and they are much improved as well - not perfect owing to poor spacing, but I can manually clean them easily. They were in good shape so now I don't have to spend an hour comparing sizes and flanges and part numbers for a dozen different sleeves. 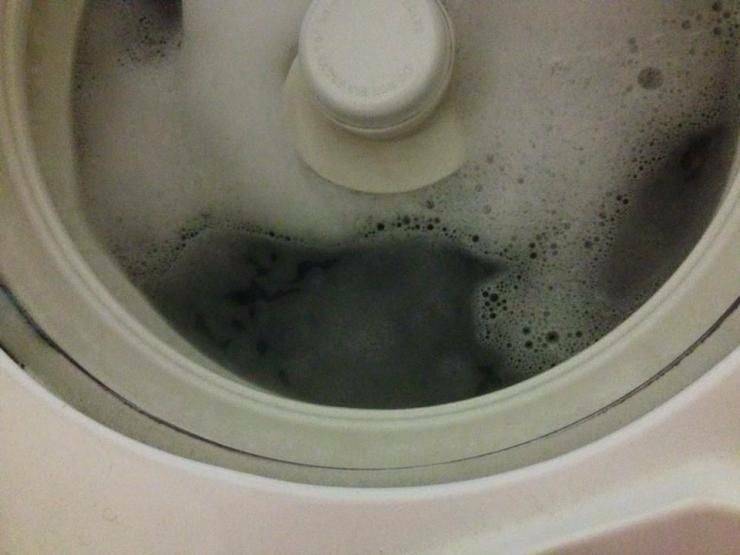 There's some trace crud in the washer but nothing a quick rinse cycle with a vinegar bath wouldn't handle. 10/10 would do again if I have to. Thanks Vid! I dont see the need to label anything.. just take sufficient amount of before pictures and you will have no problem putting it back together. 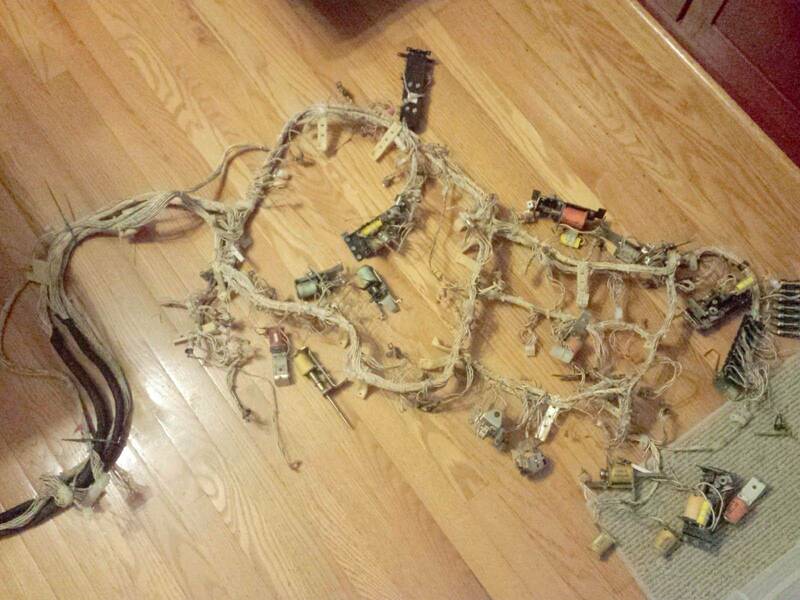 The wires have "memory" in that they will lay out out how they have laid out (more or less) for many years. 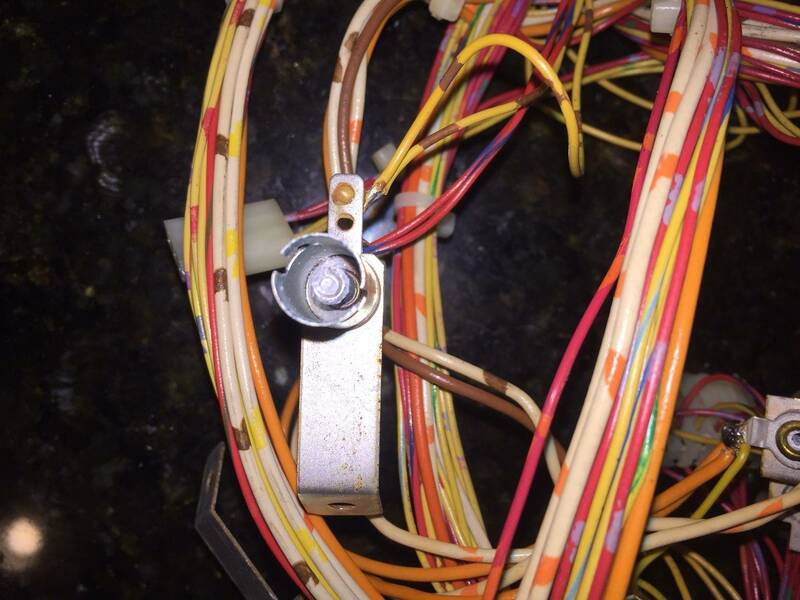 In my restorations worst issue usually is an inlane switch or lamp reversed. Just test the game before installing all the topside parts and you can quickly confirm everything is back where it should be. Thanks Vid for the guide. Usually I soak the harness in a large rubbermaid box cover and soak it in Bleache Wite equivalent like purple power or simple green but this is just to easy not to try. Funhouse harnesses going in the dishwasher soon! I absolutely love the way the things look coming out of the dish washer, but I just can't bring myself to do it either. Just doesn't sit well with me. Great thread though as usual. Guess I'll have to spring the $299 for the big ultrasonic cleaner! Use the correct amount of soap for the cycle you select. Too much soap won't dissolve, too cold of water won't dissolve. You can put the harness back in without soap and run Pots&Pans. The hot water will dissolve your remaining soap. I'll do that from now on as step 2 for good measure. 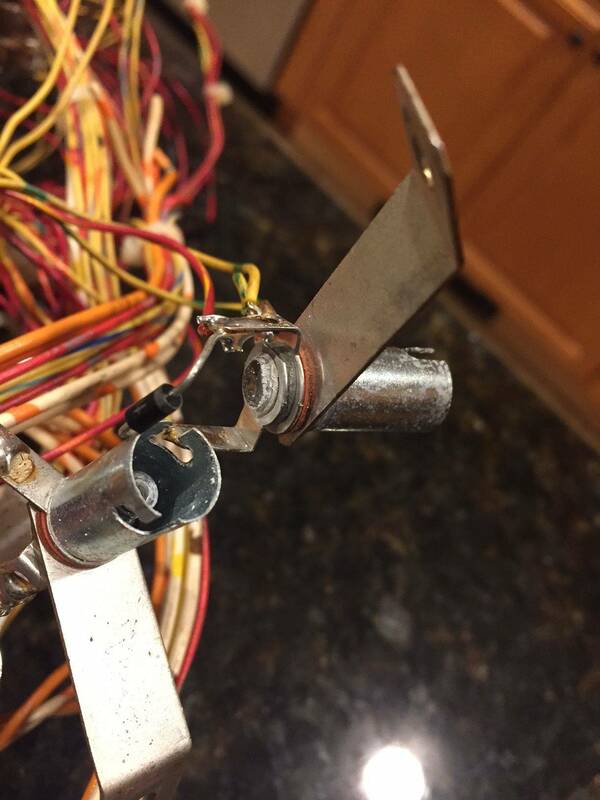 Thinking about trying this with my Nine Ball restore (https://pinside.com/pinball/forum/topic/1980-stern-nine-ball-restore-seshpilot). More than anything though, I'm grateful for a Vid-approved guide on how to actually wash dishes correctly in the dishwasher! Thanks again Vid. More than anything though, I'm grateful for a Vid-approved guide on how to actually wash dishes correctly in the dishwasher! You can't trust guys with a dishwasher. They hook up the water line to the cold water pipe. They put too much soap in so it can't dissolve. They put the 24K gold trimmed fancy plates in it, so the sand can sandblast all the gold off. They put all the spoons in one compartment, so they "spoon" together and don't get cleaned. They use regular Dawn dish soap, so everything is covered in streaks and spots. Guess I'll have to spring the $299 for the big ultrasonic cleaner! OR get a second dishwasher for less money..
You could run a garden hose from the laundry tub to a dishwasher for hot water. .....and just think. If you have an electric stove you garbage picked for your powdercoating, you garage only needs a fridge and it will have a complete kitchen.